If you eat a couple of large chunks of watermelon before a heavy training session today, you'll have less problems with sore muscles tomorrow. According to nutritionists at the Universidad Politecnica de Cartagena in Spain, this is because watermelon is a high-quality source of L-citrulline [structural formula on the right]. L-Citrulline is a precursor of L-arginine, which in turn is a precursor of the blood vessel widener and performance enhancer nitrogen monoxide. Because the liver doesn't break down L-citrulline so quickly, some sports scientists think that athletes derive more benefit from L-citrulline supplementation than from L-arginine supplementation. 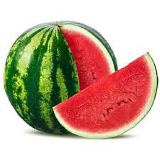 An excellent natural source of L-citrulline is melon. One litre of melon juice – which you can easily make yourself by chucking cubes of melon into a blender – contains 2.3 g L-citrulline plus 58 g carbohydrates. So if L-citrulline supplementation can help athletes improve their performance, can watermelon help them too? That's the question the Spaniards wanted to answer. To do this they first looked at whether gut cells can absorb the L-citrulline found in watermelon. The Spaniards used fresh melon juice for this, and also pasteurised juice. They discovered that gut cells absorb L-citrulline better when it's in the form of juice: unpasteurised melon juice was a good source. Apparently melon juice contains substances that improve the uptake of L-citrulline, and these are neutralised when heated. Control = L-citrulline; PW = pasteurised melon juice; NW = unpasteurised melon juice. The researchers then gave active students half a litre of melon juice [NW], and got them to cycle for an hour on an ergometer. The students had to do 30 second intervals eight times in a row. On two other occasions the students drank a placebo containing no active ingredients [Placebo], or melon juice to which the researchers had added a couple of grams of synthetic L-citrulline [EW]. The melon juices reduced the students' heart rate a little, but the effect was not statistically significant. What was significant was the effect on the muscle soreness the students reported 24 hours after the exertion. Melon juice reduced the muscle soreness. Natural juice worked about as well as the juice the Spaniards had added extra L-citrulline to. "This paper demonstrates the possible 'functionality' of watermelon juice rich in natural L-citrulline", the researchers write. "Future research should be focused on the minimal concentrations of citrulline required for reduction of muscle fatigue and other health benefits in stress, athletic performance, and cardiovascular disease. This amino acid could be supplied as watermelon juice or as products enriched in citrulline from watermelon extraction." Well. If you can't pasteurise melon juice, melon-based functional foods are unlikely to emerge soon. Only products with a shelf life of years have any chance of success in the strange world of sports nutrition. Athletes will have to do it themselves with real melons. The researchers were not funded by a melon-growers' organisation, but by their university. J Agric Food Chem. 2013 Aug 7;61(31):7522-8.